Well, yes, an intriguing title to the blog post, for sure. 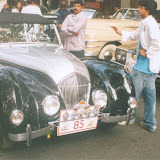 But before you think anything else, let me clarify that I am referring to the beautiful vintage cars that I saw at the Vintage Car Rally in Mumbai, last Sunday. There were cars as well as motor bikes. Well maintained, polished and looking like gold! There was a huge turnout to see these beauties, much larger than normally seen, as per one of the regulars there. For me, it was a first time view, and I was extremely impressed. Majestic Rolls Royces, Mercedes, Morris, Dodge and similar cars, and bikes like Hondas and Harley Davidsons, were on view. Just for the record, some of the celebrities spotted at the event included Mohammed Azharuddin, Amrita Arora (both flagging off vehicles), Raj Singh Dungarpur (in a vintage car) and Parvez Damania (on a vintage motorbike).